Natural alkalizer/ionizer, mineralizer, and oxidation cartridge is effective and affordable. It turns water into a perfect Natural Alkali Calcium Ionized Water. Water passes through six stages where beneficial minerals and nutrients are added back to water to create mineralized, pH-balanced result. Resulting water is much better balanced, especially if it is coming from a Reverse Osmosis system. • In stage 2 and 3, Water travels through special blend of natural calcium carbonate medias to alkalize/ionize and remineralize water and raise the pH level of your water.It reduce acidity in the body and it will produce natural calcium, magnesium, sodium and potassium ions that can be absorbed 100% in the human body. These Essential Minerals are vital to our organs. These are the symptoms when lacking of essential minerals: Fatigue, Insomnia, Loss of Hair, Depression, Diabetes, High Blood Pressure, Asthma, Decayed Teeth, PMS. Migraines, Heart Disease. Helps the body dissolve wastes and makes it easier to dispose them safely..
Natural alkalizer/ionizer, mineralizer, and oxidation cartridge is effective and affordable. 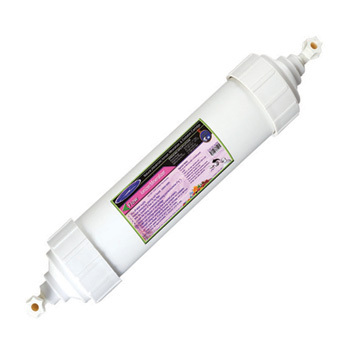 It turns water into a perfect Natural Alkali Calcium Ionized Water. 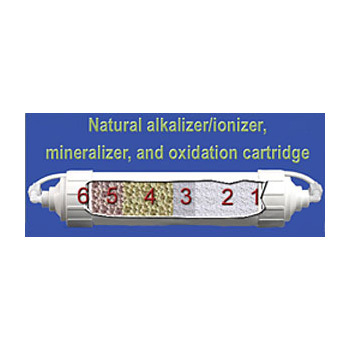 Natural alkalizer/ionizer, mineralizer, and oxidation cartridge simply gives back minerals such as ionized calcium, magnesium, sodium, potassium ion, which were taken away by Reverse Osmosis. • In stage 4 and 5, Water travels through special blend of natural Far Infra-Red and mineral balls. Far Infra-Red Rays are the invisible portion of the sunlight spectrum that has been found to promote growth and health to living cells in plants, animals, and humans. Some studies indicated positive effect on human body when using systems that properly enrich treated water. Far Infra-Red have the ability to penetrate the human body in order to activate cells. With continuous movement, the rays are alleged to reactivate cells to help strengthen the micro-circulatory system. The micro-circulatory system is often the cause of various ailments. By strengthening this system, some may reduce or even reverse ailments that have plagued their bodies for years. In the various organs of human body, the circulatory system plays an important role, especially in micro-circulatory system. When there are problems with micro-circulatory system, various ailments will occur. Far Infra-Red and mineral balls vibrating at a frequency similar to that of human body is able to penetrate the body activates cells and reactivates as well as strengthens the micro-circulatory systems. It regulates the blood flow and blood in blood vessels, which have been blocked due to blood clots and at the same time reactivate the vital energy in the body. Elevation of the immunity of our bodies against diseases is another benefit of Far Infra-Red waves. This is part of the effects of the improvement in micro-circulatory system and metabolism of the body. It helps to slow down the aging process, increase resistance against diseases and increases longevity. There is no age limit for using this product. It can be used from the day you are born until the very old age. There are no known side effects. The real effects can be measured in improved stamina, health and overall good living. Resulting water should also have lower ORP ( Oxidation Reduction Potential ).